Are you looking for some of the best website analytics tools? Understanding your Web visitors can be tough and a bit confusing as well. Each visitor is unique and usually comes with his or her own set of data that needs to be collected, scrutinized, analyzed and then reported. If you don’t know what to focus on and what to look at exactly, it tends to make the situation worse and eventually decreases the effectiveness of your website. But luckily, there are a lot of tools out there with the help of which you can sync all the information into an all-in-one report that lends you that comprehensive insight into your Web visitors. When you are equipped with this knowledge, you will get to know your website even better and you will be able to enhance its effectiveness. You will also get to know what changes you need to make so as to make it even more productive. This list compiled below of the 10 Best Website Analytics Tools would be of immense help to you. If you want to track and analyze your web traffic for free, then Google Analytics definitely won’t disappoint you. It is one of the best free tools available now. You can get hold of almost everything: from what keywords are bringing in the most number of visitors to your websites/pages, to what design flaws are turning them off. It is an all-inclusive tool which can offer you information within an all-in-one report of traffic sources, visitors, content and even e-commerce. Easily set up goals: With the help Google analytics, you will be able to set up goals so as to unleash vast amounts of data about what works in favour of your website and what doesn’t. Comparison of data ranges and in-depth tracking by geographical data: Compare certain data ranges of your own website relating to a certain point in time. You can also see how your site is doing in a variety of metrics like city, country etc. Funnel visualization: This information can help you fix certain parts that seem to be turning off visitors. Complete AdWords integration: If you want to use AdWords for advertising, it can help you with everything by providing you a comprehensive information list on groups, campaigns, and keywords and can even calculate your margins, revenues etc. Fully customizable dashboard: With this new feature you can customize your dashboard as per your choice. There are a few downsides to this tool, though; like it can take a lot of time to update, the UI is less intimidating. A more interactive UI can make things better. With the addition of new and improved features in their latest program, there is improved effectiveness; and is an extremely desirable tool to implement. In short, Google Analytics boasts a pool of extremely useful features being fully free of cost. 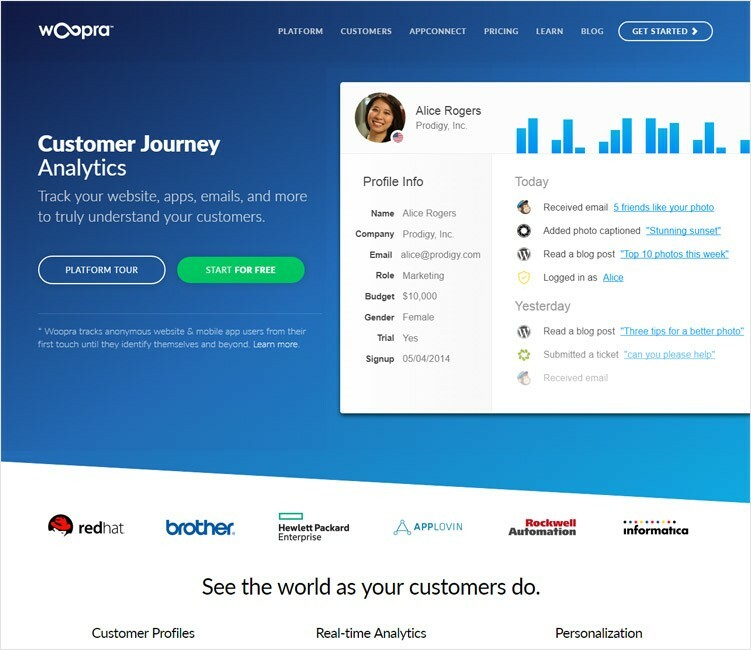 Woopra is a very potent analytics tool which offers real-time analytics tracking. It feeds you with live visitor information and all related stats like their location, the pages they have visited on your website, what pages they are on right now, and even their web browser. Woopra is similar to Google Analytics as per the type of stats and data it offers to you, but what makes Woopra different from Google Analytics are as follows. Desktop application: Woopra is a fully working desktop application, unlike Google Analytics which is Web only. Woopra also has a Web version but the full experience is offered only through the desktop client. It leads to improved performance and enhanced display statistics. Real-time tracking: One of the best features of Woopra is its real-time tracking. Google falls short on this as it takes a lot of time to update whereas everything is instant on Woopra. The desktop client has an entire space for displaying the live visitor stats. Tag and Chat Functionality: You will be able to chat live with individual website visitors. 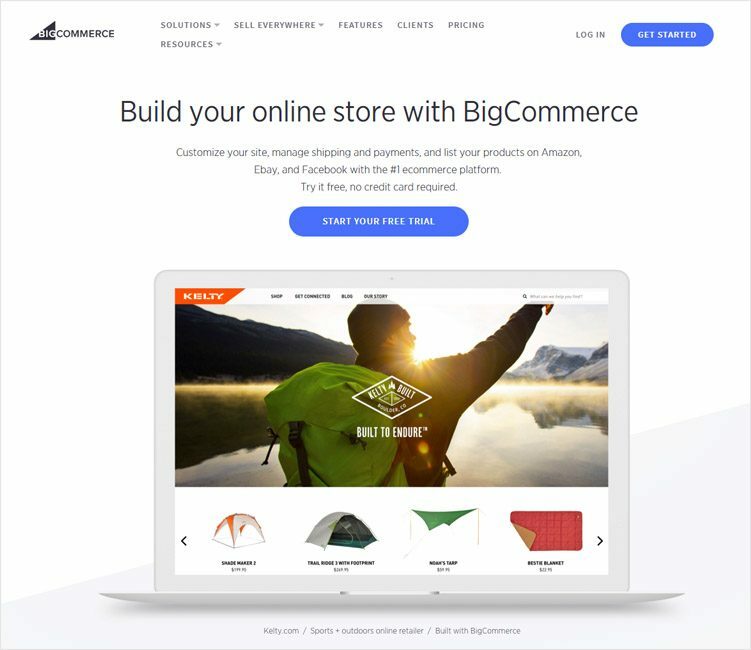 This is extremely useful to interact with customers especially if it happens to be an e-commerce site. Woopra offers a limited plan and several paid options based on data storing facilities. For example, the Platinum plan costs close to 50$ but offers data storing capabilities for only 24 months. Other than the limited data storage facility, it does not have any cons. Despite being fairly new to this field, it offers quite a lot. In addition, the UI is user-friendly. Being a customer interaction and management solution for all types of businesses, it features analytics, marketing, and automation services as well. It has taken the analytics tool and made it simpler. You don’t have to be a professional data miner to get an answer to your questions. Everything is well sorted out here. You get real-time information about conversions, sources, keywords, landing pages, email performances etc. Mode of working: Spring Metrics works quite differently from the most analytics tools. It tracks a visitor’s route to your website right from the time he visited, to the time he left. If you compare this with Google Analytics, this method is quite different but it is really effective. Real-time Conversion Dashboard: You will able to see real-time events and conversions on your dashboard. 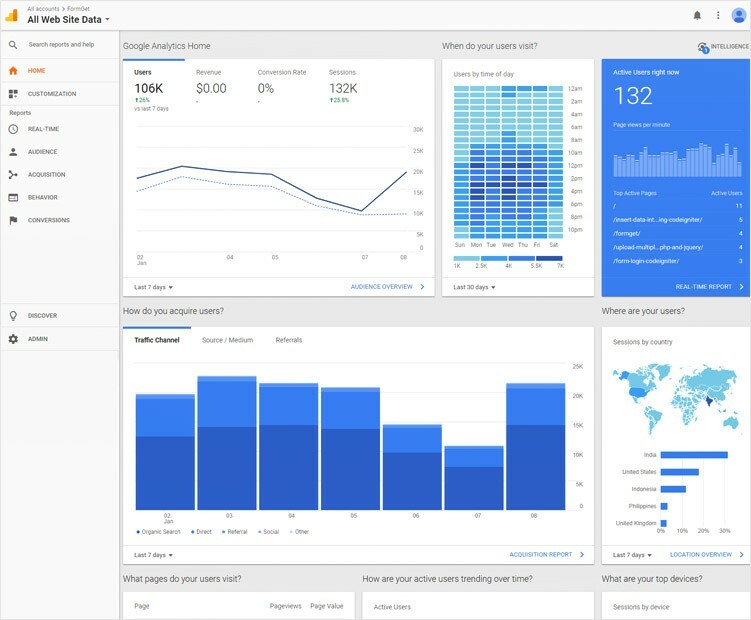 Conversion and Keyword Analytics and Intelligence: You can monitor conversion analytics and keyword analytics in many different ways with intelligence alerts in multiple properties. Fully optimized: The UI and the website are completely optimized for mobiles and other platforms. Apart from lacking marketing capabilities and no lead tracking feature, Sprint Metrics is a great analytics tool. The simplicity of use makes it very desirable. All the above features are included in their Standard Plan of $49. You can try it for free for 14 days while signing up. A very powerful web analytics tool that will help you to see just about anything and everything about your website traffic. It combines reporting with precise real-time monitoring which is not only easy to interpret but also effective. The dashboard is very simple to use and displays all the required information you want in a very crisp and clear manner. On-site heat maps: You can install the heat map directly onto your website. And unlike most other heatmaps, Clicky’s heat map is precise, smooth and works as it should. It offers incredible information about people clicking on with exact parts and sections. Real-time information about all visitors or Spy View: It offers live results and information at any point of time. This is where Google Analytics takes a back seat. The information is all inclusive and portrayed very neatly. There is also convenient go-to buttons on the interface itself which helps to get access to information, heat maps, and other things. Bounce rate: It measures bounce rates in a better way than most analytics tools. 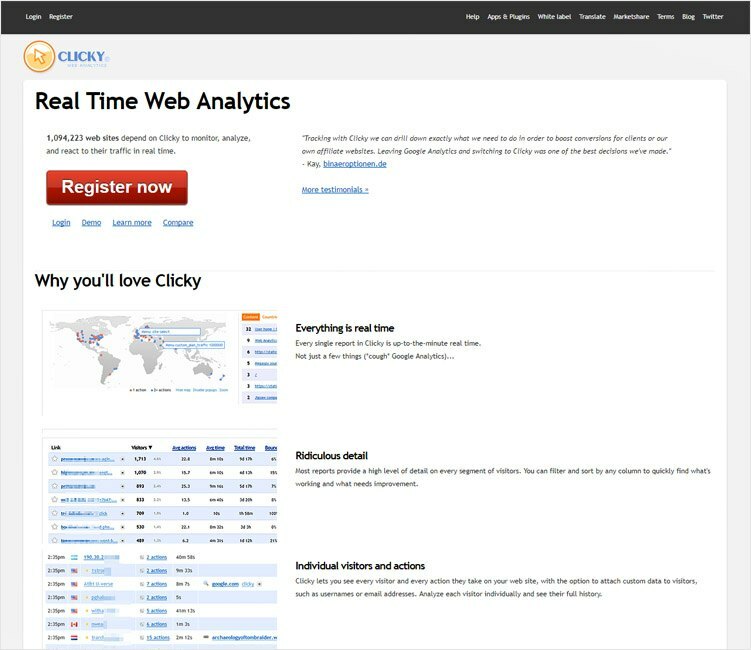 Video and Twitter Analytics: Clicky offers unique video and Twitter analytics to help you assess your work even better. You can have a better understanding of what is affecting your presence on social media. Fully Optimized: Clicky also has a mobile version for easy accessibility on the go. Clicky is a perfect combination of simplicity, power, and value. It is free if you have only one website and a Pro account for a monthly fee. 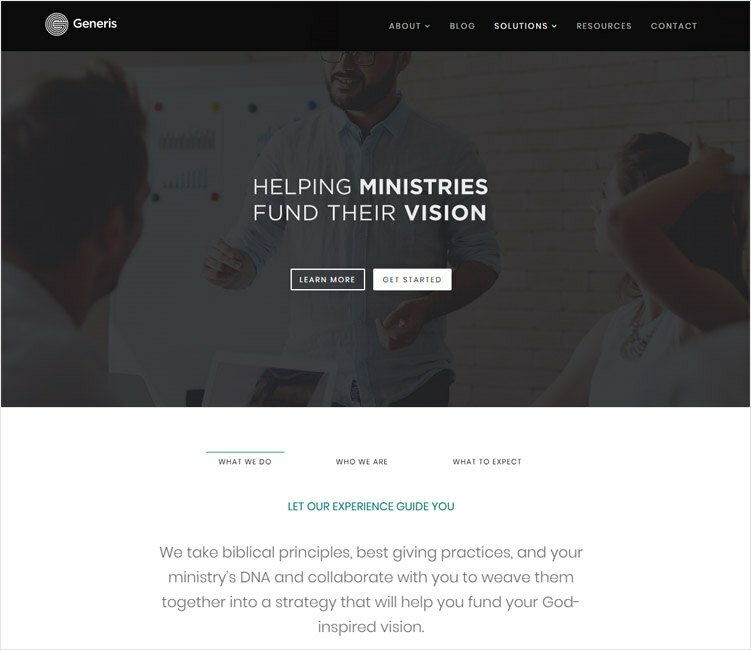 Church Analytics is a relatively new candidate on the market, but it is a very robust system. It is a completely unique system offering real-time web analytics for both web and mobile. It can provide end to end reports of all your traffic within seconds. It will collect all the site information, data and precisely examine traffic using fast and reliable hosting system. It is something different than other analytics tools as it provides everything at one place and on a single page. Comprehensive visitor information: You will get almost any information of specific visitors like where traffic is coming, what is the source of the particular traffic, how much time they have spent on a particular web page, the browser in use and even the operating system in use. Compatibility: It is available across mobile platforms including iPhones as well. You can track all the activities from anywhere and on the go. Live tracking and real-time information: It offers instant tracking facilities with real-time information of traffic on one single page. FeedBurner statistics: This feature makes Church Analytics stand out from the rest. With the help of this, you can get all the information about traffic or potential customers who have subscribed or activated to all the services offered by you. Social Media: Easy Twitter and other social media integration. Dashboard: Fully customizable dashboard consisting of all the required things in a single page for easy access and execution. Apart from these features it also offers daily reports which portray complete information about traffic in your website. Church Analytics comes with three active plans that you can go for, Solo, Small, and Large, which eventually depends on page view per month. Chartbeat is one of the most renowned and powerful analytics tools out there. It offers instant information thereby measuring and improving the quality of your content and the loyalty of your audience. By notifying every second, it monitors for active changes which determine when visitors are reading the content on a website. 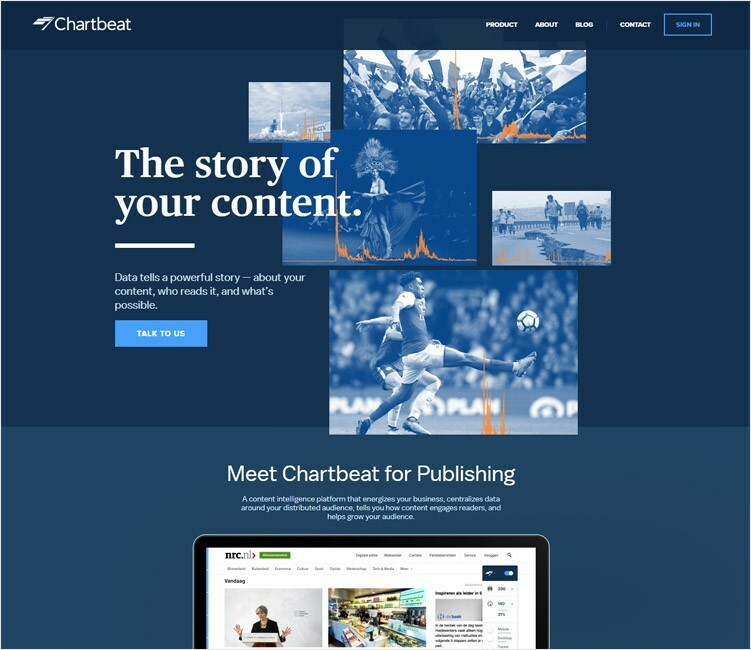 Using both real-time and historical stats and data, Chartbeat offers workable insights on how to enhance layouts, attract new visitors, expand socially and capture the attention of readers. Automatically recorded and real-time information: Just like other analytics tools, Chartbeat also offers instant live information but with a unique feature of recording each visit automatically. You don’t have to refresh the page to get the new numbers of visitors and information. Real-time monitoring: It offers real-time monitoring of traffic sources providing crucial information on where the majority of visitors are coming from. This can definitely help you to spruce up your marketing plans so as to bring about the necessary changes to increase exposure. It can also help you connect with people to encourage more visits. In-page analytics: You can determine what your target audience finds more attractive on your pages. With this information, you can develop more suitable content so as to turn a weak page into a popular one. And all this in real time as well. Social Media Incorporation: Chartbeat can monitor Twitter and Facebook activities and even Pinterest activity. So you can develop your social strategies accordingly. When you sign up, you can use Chartbeat for a free month and after that, it’s 9.95$ per month which is very nominal for a tool of this quality. 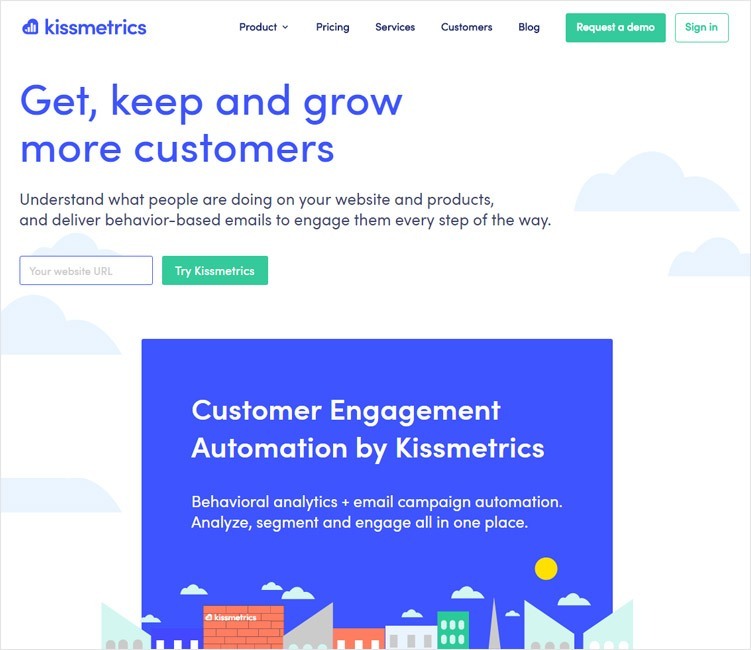 Kissmetrics is a very powerful platform that lets you monitor, interpret and enhance the metrics and other related sections conducive to making your business successful. With the information turned into useful insights and in-depth understanding, it can help you create potent marketing strategies and can even improve the existing ones. It has a very flexible design with a very simple API. It is known to have a structure which focuses on people, assessing customer trends and changes, and furnishing useful interpretations. Most of the features are same just like other analytics tools- such as real-time information, in-page analytics etc. Multiple marketing channels and conversion funnels: It helps you identify quickly which marketing campaigns are working and which aren’t. It is prompt in making you understand where your valuable customers are coming from. User conversion assessment: The unique feature about Kissmetrics is that it can tell you the percentage figure of visitors who are signing up or buying products. It can also tell you how long it takes to do so. It will help you to target the areas where you can reduce sign up times, and do the required changes so as to increase revenue. Engagement metric: With the help of Cohort analysis and remarketing, it helps improve user engagement and eventually target the right users. Reporting on Kissmetrics is very easy and even simpler to operate. The dashboard boasts everything you need. It is free for the first month after sign up. After that, there are many plans that you can go for- ranging from $200 per month for the starter pack to $2000 per month for the Pro pack. Heap is a proper event-based analytics tool used to enhance website and app performances. It is real-time. It boasts advanced conversion funnels and offers precise analysis of data that is very important to modern websites and apps. No need for push code: In order to track a certain event, just specify the event with CSS selector and the event will be automatically ready to analyze. 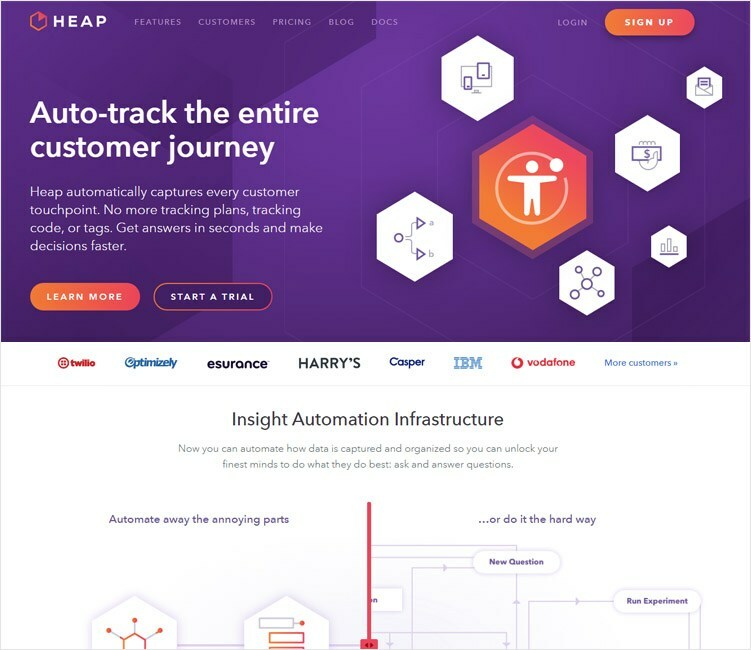 Automatically track events: While on the web, Heap can track every single page view, click, and can do much more without any input from your side. On mobile as well, Heap tracks swipes, taps, and any other gesture events automatically. Individual User Tracking: You will be able to see individual user histories. You will get a complete idea of every single thing a given user has done. Heap is free for apps till 5,000 sessions per month. It also has custom pricing or pricing tiers which are assessed by your needs and requirements. Crazyegg is a powerful online application which offers web analytics in the form of eye tracking tools. It uses the power of heat map technology to give you a visual interpretation of what your site visitors are doing on your website or on specific pages. This helps to pinpoints you where your visitors are moving their mouse on the page and their exact clicking patterns. Heat map: It gives you a clear picture of where people clicked on your site. With the help of this heat map, you can make the required changes that increase conversions and overall performance. Scroll map: This typically shows how far people are scrolling down the page. So eventually, you will be able to determine where visitors abandon the page. You will have a basic insight into what to do to make your website more desirable. Overlay: This feature offers a report where you will be able to see the number of clicks on each and every element of your website’s page or pages. Confetti: Confetti helps to determine all the clicks you get on your website separated by search terms, referral sources and much more. 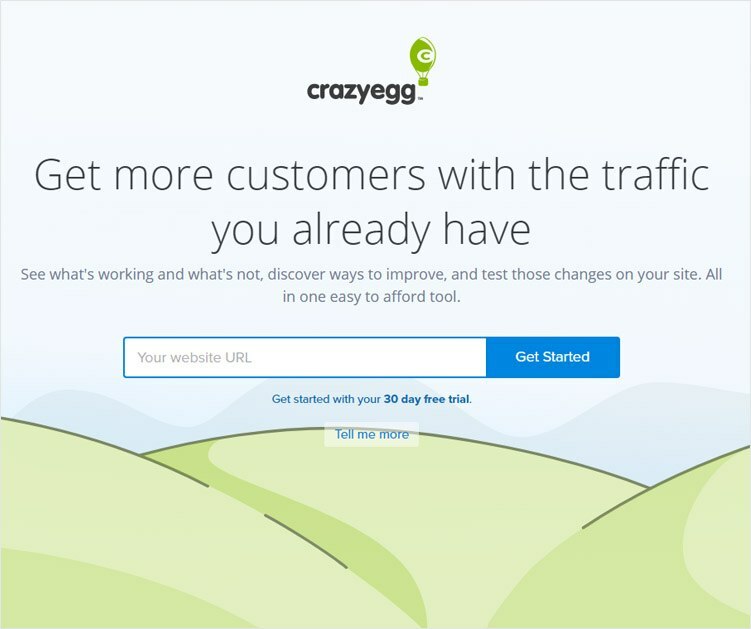 Basically, Crazyegg helps you to see what areas are catching the most attention from users. You can opt for a free one-month trial and then prices start at 9$ per month for the basic plan to 99$ per month for the pro pack. Mixpanel is an advanced web as well as a mobile analytics tool, offering solutions to businesses of any size. It is designed and developed to analyze user behavior. This type of tracking was once only reserved for large and heavily funded organizations, but now Mixpanel makes it accessible to any type of business- irrespective of its size and funding. Action based analysis: Most of the common analytics platforms monitor page views. Mixpanel takes a different approach and monitors actions or steps taken by visitors who enter your application or website. And this action can be anything. It can range from image uploads, streaming videos or sharing a post etc. 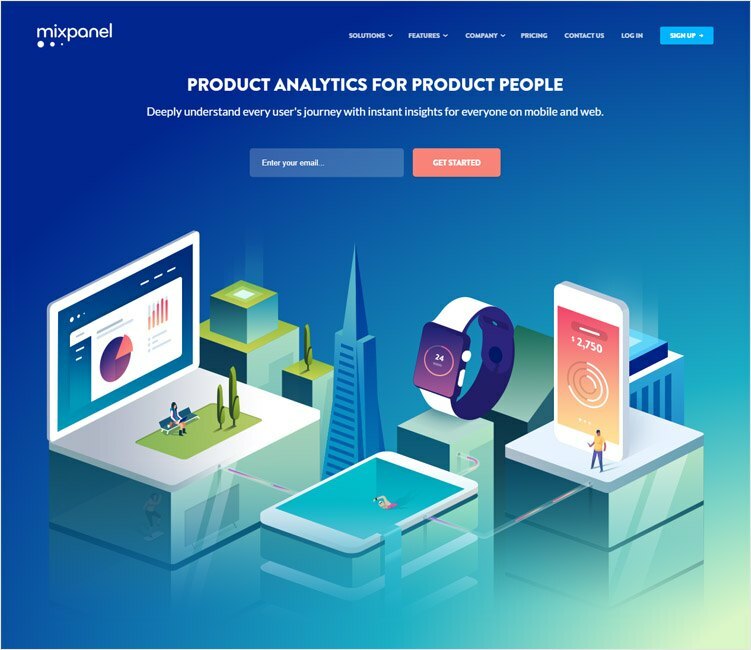 Customizable funnel analysis: Unlike Google Analytics, with Mixpanel you have the option to build your funnel later and analyze your users going through it. Comprehensive Cohort analysis: Mixpanel measures whether new users come back again to use your app or visit your website. It also helps you determine the frequency of their visits. There is a host of features rolled up into Mixpanel like improved data accuracy, mobile a/b testing and much more. To avail Mixpanel, you can go for six different pricing plans depending on the number of data points. The basic startup plan is 150$ per month and goes up to 2000$ per month for commercial plans. There is also a custom pricing plan for high volume orders. In any business, tracking statistics and interpreting data is very important. Without a good analytics system, your web business is headed nowhere. It is very much essential in order to make the right choices at the right time. Choose the one which suits your requirements the best.